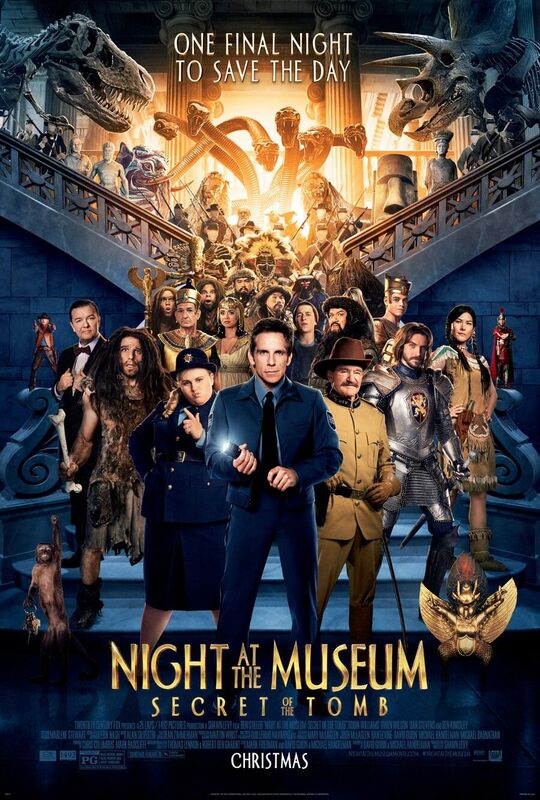 The second of two trilogies concluding this Christmas, the Night at the Museum films have had their ups and downs with its plotting and humour, but have always managed to keep that sense of fun for the sake of their younger fans. This third and supposedly final entry is more of the same, but is it a worthy conclusion to the mayhem? This is definitely a film where the time gap between the second and third film perhaps does more harm than good. Battle of the Smithsonian, the middle-child of the series, came out in 2009 just as the charm from the first film (released three years prior) was starting to die down, giving it a bit more of a spark. Here, though, it’s been five years since last time – if there was any charm left over, it would had been completely disintegrated by now. There were hardly any cries out for another film in the series, because it had been too long since we previously left things that people have tended to forget about them, or even care. Watching this film feels like watching a bunch of producers at their most desperate to mine for all it’s worth, even though they’ve hit solid rock at the bottom of the crevice. The reason such a lengthy gap between sequels worked for films like Toy Story 3 was because the films that came before it had true lasting power, thanks to its characters and story. 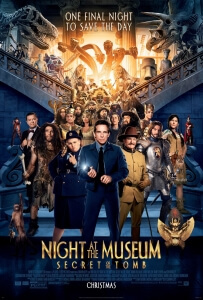 The Night at the Museum films, as fun as they were, unfortunately did not; there were never that many interesting characters, and the humour could be extremely awkward instead of laugh-out-loud funny. It had its fans, but it didn’t take long for the appeal to wear off over time. So, where does that leave Secret of the Tomb, a film that by any means shouldn’t really exist other than to mine a now-irrelevant franchise? If you weren’t a fan of the first two films then this film won’t win you over; it still has that awkward sense of humour that has you cringing more than laughing (particularly with one starry cameo that’s literally show-stopping), with certain jokes that go on for a bit longer than necessary, and once again the characters range from lampposts to wallpaper decorations. There’s nothing too bad for kids, in that it doesn’t send out awful messages or anything, but the harmlessness of it all makes it a safe and rather dull product to end this particular series on. However, that’s not to say that it’s a complete failure of a product in its own right, because there are some things that do genuinely work. As bland as the characters can be, including a terminally disinterested Ben Stiller (who, if you look closely, you can see pining over the paycheck being dangled in front of the camera), you can identify a small sense of comradery between them, as if they’ve all known each other for years and their friendship is reaching critical mass. Of the few new additions – including Ben Kingsley, whose role is nothing more than an extended cameo – it is Dan Stevens’ Sir Lancelot that leaves the biggest impression. It’s clear that he’s having more fun than most of his co-stars, completely embracing the absurd kid-friendly nature of everything around him and making the most of it. However, he also leaves room for an unexpectedly human trait that kicks more into effect after a certain third-act turning point, and his character goes through a development which Stevens delivers with a subtle hint of sadness to it all. After The Guest, it’s no surprise that the former Matthew Crawley is starting to become more prominent in major film releases and with this, he shows the world that he can play it silly as well as straight. Finally, we would like to discuss the ending, which starts off very strongly with an emotional, poignant, surprisingly mature decision made by certain characters. One-on-one exchanges are made that round their arcs appropriately and can be rather touching for those that have watched the previous two films, and it all concludes on a bittersweet but satisfying note. But then, it does a complete cop-out after everything it had just gone through, all with the purpose of having a “happily ever after” scene for the kids. Now, we don’t know if that was a decision made by anxious studio heads or was in the script from the beginning, but either way someone screwed up royal here; a perfect ending has been ruined by an unnecessary tag-on, destroying the poignancy and mature tone of the previous scene just for something they feel will be more kid-friendly. However, that decision doesn’t make it more kid-friendly; if anything, it treats them more like little morons than actual children. Kids, who most certainly are not morons, can handle bittersweet endings fine without being traumatised by them – again, it worked for Toy Story 3 – and this insertion of the “everything will be alright” feel-good vibe they’ve tacked on at the very end is the one that sends the wrong ideas to them. That first ending worked so well because it taught the good moral that at the end of the day, adult choices have to be made even if they don’t work out for everyone; what they did was tear it apart and glue in its place something that says the exact opposite which in and of itself is immature and lazy. What an awful way to end a completely average movie, which also ends a completely average film series. The Night at the Museum films may never have been as popular as something like Toy Story, but the ending to Secret of the Tomb will likely kill all respect one has to those films.